(NaturalNews) Bad news for migraine sufferers who don't take preventative measures to decrease migraine frequency and severity. A meta-analysis of six population-based (epidemiological) studies and 13 clinic-based studies was conducted at the University of Copenhagen in Denmark. The study author, Messoud Ashina, MD, PhD, stated, "Our review and meta-analysis study suggests that the disorder may permanently alter brain structure in multiple ways." Sorry about the scary notice. But relax. 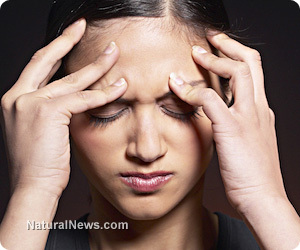 There are solutions for decreasing frequency and severity of migraines naturally. Decreasing migraines naturally instead of using preventative prescription drugs, such as the antidepressant amitriptyline, sold as Elavil, Tryptanol, Endep, Elatrol or Tryptizol, has been proven effective with clinical trials. A study in Belgium published by the American Academy of Neurology in 1998 investigated vitamin B2's, (riboflavin) effect on migraines. Fifty-five participants took part in a double-blind, randomized study. They experienced 37% less migraines after three months of vitamin B2 doses at 400 mg. The researchers attribute this to riboflavin's ability to boost mitochondrial energy. Coincidentally, another nutrient, resveratrol, has shown very strong evidence of increasing mitochondrial density and activity. Keep that in mind. Another migraine preventative study on butterbur or Petasites hybridus root extract was conducted at the Albert Einstein College of Medicine in New York and published in the journal Neurology at the end of 2004. Two-hundred and forty-five migraine sufferers between the ages of 18 and 65 with a frequency of two to six attacks monthly were divided into three groups. A control group was given placebos, and the other two groups were given butterbur doses of 75 mg or 50 mg.
After four months, the 50 mg group did better than the placebo group but not as well as the 75 mg group. The 75 mg group had a 48% reduction in attacks compared to the placebo group, and 68% of the 75 mg group had a 50% or more reduction in migraine frequency. A study presentation at the March 2012 American Academy of Neurology that clinically studied melatonin compared to amitriptyline, used in several brand name pharmaceutical antidepressants, and placebo doesn't appear on any Google searches yet. But several attendees sang their praises of the study's procedure and findings. And more than one source or site has reported on the findings. Bottom line, melatonin works as well as or better than amitriptyline without side effects except for better sleep and weight-loss. Amitryptyline commonly creates weight-gain and daytime drowsiness. The often advised migraine "trigger" diary, avoiding processed foods, especially with MSG (research its disguises) or aspartame, living with less stress, acupuncture, yoga, and meditation have all shown merit. Increasing your magnesium uptake with bio-available magnesium has proven itself in clinical trials as well. More here (http://www.naturalnews.com).